We receive numerous emails from iPhone XS Max users saying their devices show “No Service” even if cellular connection is available. Users further state that their phones randomly drop a cellular data connection and their phones has no signal bars. This problem can be really frustrating because “No Service” means that several basic features like texting, calling and using cellular data will not be available. This article explains what you can do to fix the “No Service” issue. Update your iPhone XS to the latest version of iOS. Simply go to Settings > General > Update. Several users have said that turning off LTE or 4G may help if you see “No Service”. On your iPhone, go to Settings > Cellular > Cellular Data Options > Enable 4G or Enable LTE (depends on your carrier’s network) and select Off. As you can guess, however, you won’t have a faster data connection. Turn on Airplane Mode and wait a few seconds and then turn it off (Settings > Airplane Mode). Restart your iPhone. To do that, press and hold the Side button and either volume button together until you see the red slider. Then slide the slider. Wait until your device is completely turned off. Then press and hold the Side button until you see the Apple logo. This can be a carrier issue (AT&T, T Mobile, Verizon etc). There are two things you can do. The first thing is to upgrade your carrier settings on your iPhone XS Max. You can do this by going to Settings > General > About (make sure that you have a Wi-Fi connection). If there is an update available, you will see an option (see the image below). 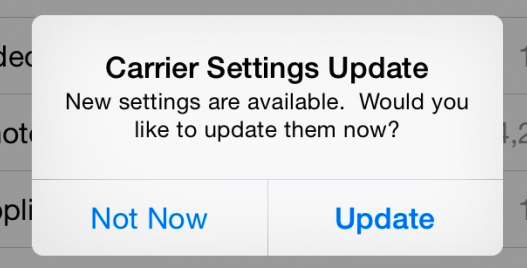 Simply tap Update to update your carrier settings. The other thing you can do is to make sure that there are no issues with your carrier. Check in with your carrier about your account. Maybe your account is cancelled, suspended? Maybe your payment is late? 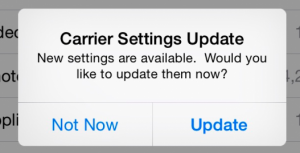 Maybe your carrier is having temporary network problems that it is trying to fix ? Contact your carrier. You may want to call them to inquire about this so that your account is active. Reset your network settings. Please note that this will reset your Wi-Fi passwords etc. Go to Settings > General > Reset > Reset Network Settings. See also: No SIM card installed issue? If you are still having this issue, you may want to have your phone examined by Apple. Simply make a Genius Bar reservation. Or you can report this to Apple. I am unable to make in-app purchases for Mobile Legends. What can I do to fix this?